The rail authority expects to collect $188 million more in taxes than previously projected to help finance the Honolulu rail project, but the city is still making plans to cut costs if necessary, including possibly deferring construction of the $315 million Pearl Highlands Parking Structure and Transit Center. That’s according to a draft recovery plan for the troubled 20-mile Honolulu rail line obtained by the Honolulu Star-Advertiser. The report lists an array of cost- cutting steps that could be taken if funding for the project again falls short. Those could include eliminating lighting between stations along the 20-mile rail line, modifying sound barriers downtown and redesigning the overhead canopies that will provide shelter at the eight urban Honolulu rail stations, according to a draft plan. The recovery plan is essentially the city’s updated blueprint for how it will complete the rail line. The rail line from East Kapolei to Ala Moana Center is the largest public works project in state history, and has been bedeviled by years of delays and cost overruns. The city signed an agreement with the Federal Transit Administration in 2012 that called for rail’s elevated guideway and 21 stations to be built for $5.26 billion by 2020, but the project is vastly over budget. Construction and financing of the project are now expected to total about $9 billion, and the rail authority expects to finish the project in late 2025. 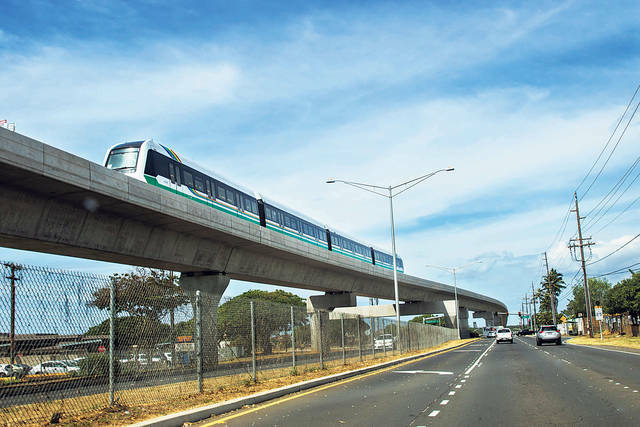 The FTA committed to provide $1.55 billion in federal funding to help Honolulu build the rail line, but has withheld nearly $744 million of that money until the Honolulu Authority for Rapid Transportation develops an acceptable recovery plan. State lawmakers last year approved a $2.4 billion bailout of rail, and the last major piece of the recovery plan fell into place last month when the HART board of directors authorized a public- private partnership to develop the last 4.1 miles of the rail line through downtown Honolulu. HART is expected to officially release the rail recovery plan late this month, but has been circulating a draft of the plan among HART board members this week to gather comments from the board. The new draft recovery plan incorporates that public-private partnership, or “P3” proposal, and also provides updated financial data for the rail project that shows higher-than-expected hotel and excise tax collections are giving the project a boost. According to those calculations, the rail authority expects to collect $117 million more in excise taxes between now and 2030 than it had projected a year ago. HART also expects to collect $71 million more in hotel room taxes by 2030 than it projected last year. The largest potential construction cost saving listed in the recovery plan would come from deferring the Pearl Highlands facility, but HART hopes to avoid that option because it would cause other problems. The 1,600-stall Pearl Highlands parking structure is supposed to serve commuters traveling between central Oahu and downtown. Eliminating or deferring the parking facility and bus transit center could reduce rail ridership, according to the draft plan. The new P3 contractor is to be selected next September, and is supposed to build the Pearl Highlands parking garage and bus transit center along with the rail line and eight rail stations in the city center. But the draft recovery plan acknowledges that work might exceed the project’s “affordability limit,” and the parking garage and transit center might be deferred. If that happens, HART and the city would have to “pursue other sources of funding to pay for the (Pearl Highlands facility) at a later time,” according to the recovery plan. That would be a last resort, and would require the city and HART to seek less expensive parking and bus-rail connections in the interim near other stations, according to the draft recovery plan. “HART is currently evaluating how (the Pearl Highlands facility) could be addressed as an optional scope element in the P3 procurement,” according to the recovery plan. Andrew Robbins, executive director of HART, said the rail authority has no intention of cutting that facility. “We understand the importance of it for Central Oahu, it’s extremely important for residents in Central Oahu to have that parking garage and that transit center,” he said. However, the option of deferring the facility had to be included in the recovery plan as a fallback option to satisfy the FTA, he said. The recovery plan lists other strategies that have already been taken by HART to reduce the cost of rail, including separating a contract for utility relocation work in the city center from the larger P3 construction contract. The draft plan indicates that repackaging of contracts saved the city $300 million, and claims another $177 million in savings through other steps. However, most of those “risk reduction” steps that generated the $177 million in reported savings are not listed because they are confidential, according to the draft recovery plan. The draft recovery plan also projects that use of the P3 approach to build the last segment of the rail line and operate the system for the next 30 years will save $50 million in construction costs, and another $310 million in operating costs during the life of the contract. Other potential cost saving steps that could be adopted by the P3 contractor include using concrete sound barriers instead of acrylic sound barriers along the guideway, eliminating lighting between the stations, simplifying the overhead station canopies and using plain support columns rather than the decorated columns that have been used in other rail segments. Those steps together could save $19 million, and the contractor could save another $20 million by reusing the current Leeward Oahu precast yard, where segments of the rail guideway are being fabricated, according to the report. HART contends it will be able to build the entire rail line for $8.165 billion, not counting another $855 million in borrowing costs. However, the FTA projects the actual construction cost will be $8.3 billion, and the project will not be finished until September 2026. HART agreed to use the FTA’s higher cost estimate of $8.3 billion, and also to use the the FTA’s projected completion date of 2026 in its draft recovery plan, but the rail authority remains “committed to the residents of Honolulu” to finish the project by the end of 2025 for $8.165 billion, according to the recovery plan. >> Defer construction of the $315 million Pearl Highlands Parking Structure and Transit Center. >> Eliminate lighting between stations along the 20-mile rail line. >> Modify sound barriers downtown. >> Redesign the overhead canopies that provide shelter at the eight urban Honolulu rail stations.